With sunny and warm weather comes a simple beauty routine that focuses on dewy skin and pink lips. During the warmer months I like to keep my makeup as natural as possible. 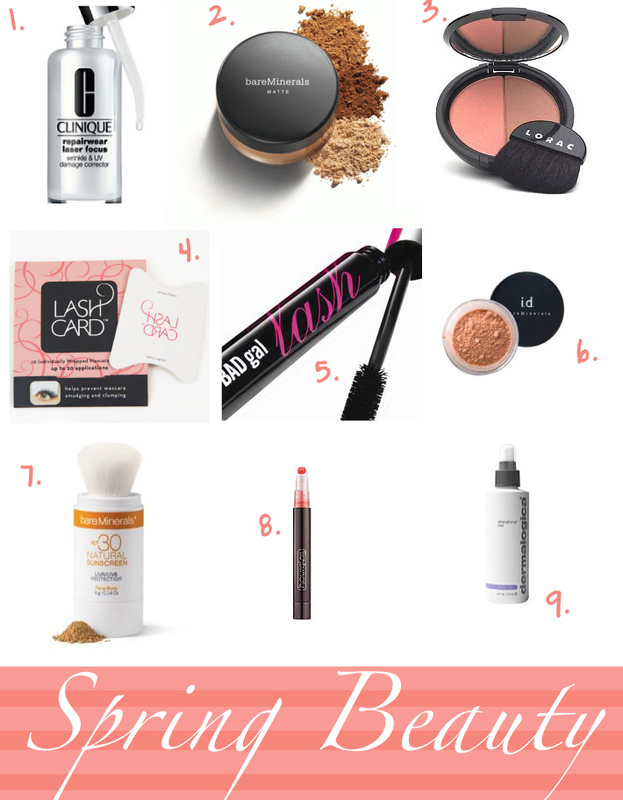 These are my current must-haves for a natural spring look. Do you have any go-to products for spring? Ahhh I forgot about that lash card! Must get mini-me one. 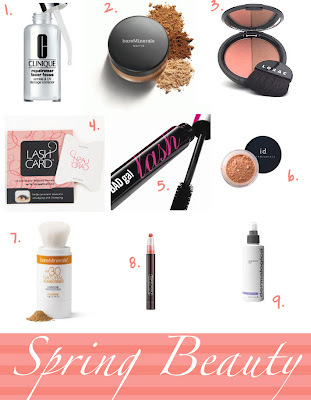 Something I am loving, simislar to the #7 is peter Thomas Roth powdered sunscreen. It's colorless powder. I put it on before I run. LOVE it. I pretty much use the same products all year but I do up the sunscreen in the summer months. With living in sunny California this fair skinned red head has to slather herself in it daily! I use the same products year round with the exception of switching to tinted moisturizer in the spring/summer from my usual foundation in the fall/winter!! I really want to try that new Clinique stuff!!! Have you tried it?! 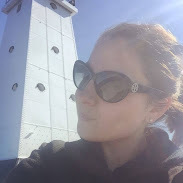 Avon makes a lightly tinted, SPF 20 moisturizer that I can't get enough of in the spring and summer...oh, and blotting sheets to combat the humidity! Bare minerals foundation is my year-round staple! Ooh I want to try the Lorac bronzer! I plan on getting some of the lash cards. I think I wear less make up the warmer it gets. All I need is a good SPF cream. NARS blush/bronzer in Laguna Beach, Smashbox primer, Proactiv all year long! OMG and I LOOOOVE the look of your blog, so pink and feminine *ahh* love! That lip stain looks nice!